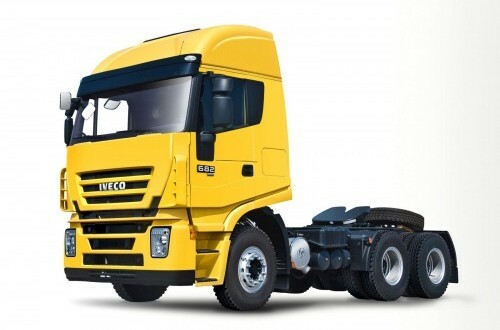 Iveco reputable transport company cooperated with PT Chakra Jawara on Saturday launched a heavy-duty trucks Iveco 682, which is intended both for transport on the highway (on-road) as well as off-road such as in mining. Iveco's latest truck models were launched in the arena of auto shows Gaikindo Indonesia International Auto Show (GIIAS) ICE 2015 in Serpong, South Tangerang, Banten. Iveco 682 inspired by the Fiat 682, the first heavy-duty trucks manufactured between the years 1952 to 1988, it has been designed to meet the demands of the market Iveco Indonesia. Iveco 682 was engineered to tackle a wide variety of specialized jobs and have high adaptability to the body builder (developer truck bodies). Iveco Product Manager for Australia, New Zealand, Southeast Asia, and Japan, Marco Quantara said that Indonesia is one of the most promising truck market in Southeast Asia. Iveco 682, which was launched today, according to Marco, an amalgamation of all the knowledge and experience in designing and manufacturing Iveco trucks, so as to provide optimal solutions in the power, economical fuel consumption, and the quality and the price is very competitive. "We believe that the Indonesian truck market will be interested in our new truck this is Iveco 682 that has proven quality, durability, reliability, and most importantly cost efficiency are hallmarks of Iveco products," he said. While Teophilus Bambang Wira, Director Chakra Jawara, Indonesian transport equipment solutions company that becomes partner Iveco, said that now Chakra Jawara is the holder of the exclusive license to market Iveco Indonesia. A subsidiary of PT Tiara Marga Trakindo was established on December 1, 2000 and is engaged in integrated service solutions for machinery and transportation in Indonesia, with a market mining, forestry, construction, oil and gas, as well as container transport. "With a range of information systems owned by Tiara Marga Group, all the branches we have access to the electronic program Integrated Systems Applications and Products (SAP), which is designed for spare parts inventory management effectiveness and operational schedules," Bambang added Wira. Iveco 682 carries the new cabin design adapted from the Iveco Stralis cab design that has earned national awards. Iveco 682 spacious cabins claimed to be very comfortable, high roof and the wide windscreen for optimal visibility. The steering wheel of the truck is fully customizable and all controls can be easily identified to ensure safe and comfortable driving. The interior, including the driver's seat, air conditioning unit, 12 storage boxes designed to increase driving comfort. Iveco 682 powered by Iveco Cursor 9 with engine capacity of 8,700 cc six-cylinder in-line engines are available in two different power levels; 345ps and 385ps. The truck is offered with high tensile steel chassis double neck, made to carry heavy loads and extra weight according to customer requirements. The cabin has passed the test of ECE-R29-2, supported by the ABS braking system. Iveco is available in a 6x4 drive system (GCW 60 tonnes) for variants head tractor, 6x4 drive system (30 ton GVW) Tipper variants and models for Concrete Mixer. Iveco 682 marketed from IDR900 million.